Crunchy, creamy, sweet tasting macadamia nuts are one of my favorite snacks, but it wasn’t until today that I tried them in a smoothie. My mistake. 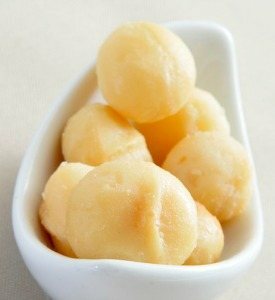 Besides being quite delicious, macadamias nuts are loaded with health supporting nutrients, vitamins, minerals, protein, and healthy fats. They are a good source of many minerals including manganese, iron, magnesium, phosphorus, copper and the vitamin thiamin. They’re also high in dietary fiber. Some people shy away from macadamias because they’re high in fat, but that’s precisely why I love them. About 80% of their fat content is monounsaturated or “good” fat. It lowers your LDL (“bad”) cholesterol and raises you HDL (“good”) cholesterol. Macadamia nuts also contain the all important omega-3 fatty acids, vital for your brain, nervous system, and fighting inflammation among other things. My Blendtec pulverized the macadamia nuts, but lower end, less powerful blenders might leave you with a few chunks. No biggie, just something to keep in mind. Enjoy! Place all of these lovely ingredients into your high-speed blender and blend for around 30-45 seconds or until nice and smooth. I’d love to know if you tried this coconut macadamia nut smoothie – please tell in the comments below. Happy Blending! Need your free e-book smoothie recipes please. Hi,I am going to make your coconut macadamia smoothie when I go buy eight of the ingredients sometime this month. Do I have to cut up the nuts before putting the nuts in my magic bullet blender?I am going to the bulk barn to buy some of the ingredients and then go to Safeway to buy the rest of the ingredients,then I will make this smoothie in the kitchen. I will let you know how much I love drinking this recipe soon. You don’t need to cut or chop the macadamia nuts, Kim. Toss them right into your Magic Bullet. Enjoy! hi,I was wondering if you can help me with the coconut macadamia smoothie recipe.i don’t have an avocado,no coconut water,no banana,no coconut oil,and no cinnamon. I have macadamia nuts,coconut milk,chia seed powder,coconut flakes,cacoa powder,stevia packets,frozen mixed fruit,i have protein powder to put in it.should I wait until I have the rest of the ingredients to make this smoothie? While I almost always say use what you have available. In this case, I would advise against making this smoothie until you have all the ingredients. It will taste that much better. Hi,i just made your coconut macadamia nut smoothie and I am drinking it as I type this note to you.wow it tastes really good.i even added two of the add ons to the smoothie along with the other ingredients. Hi,i have all of the ingredients to make your coconut macadamia smoothie but i don’t have blueberries to put in your smoothie.i have saskatoon berries in a container in the kitchen freezer.can i use these berries in the smoothie instead of the blueberries? I just bought enough groceries to make your smoothies to last me a while. Hi,i just made your smoothie and even though i didn’t have the 2 ingrediants (frozen banana and the blueberries) your smoothie tasted really good with the saskatoon berries which were frozen,but my smoothie was on the thick side so i just added a little bit of water and it is really good. Saskatoon berries are just as good as blueberries, Kim. Nice substitute!